I started reading this for the Booker Prize group or I might not have picked it up and that would have been so sorrowfully my loss. In fact, I am enjoying it so much that I don’t want it to end and am reading a bit slowly. On the other hand it’s confusing about the time frame and I’m not really familiar with the history of Malaya. – S0 – I got the Audible version, too – (found it on sale)! Judge Yun Ling Teoh is having language and memory issues (aphasia) and is forced to retire from the bench to live at her country estate in the Malayan Cameron Highlands where she plans to write her memoirs. This is in the late 1980s but the times about which Teoh writes are mostly in the late 1950s during the Malayan Emergency but older memories of the Japanese occupation come up regularly. Already in Chapter 1 a number of themes seem to reveal themselves -‘nature vs control’ is the big one, but the theme of memories, in a woman who is losing hers, will likely weave into that. And the “borrowed” landscape gardening vs indigenous landscape is a huge metaphor spreading into the ethnic issues of Malaysia. It’s very concisely written and going back after reading one chapter is enlightening. It seems that the Chinese-Malay Judge Teoh has a collection of artworks by her Japanese friend, the “gardener of the emperor,” Aritomo, who created ukiyo–e, “pictures of the floating world” woodblock prints (gallery). 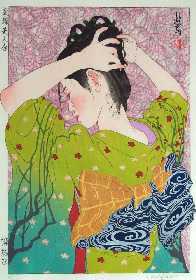 There is a possible buyer for the works but he’s also Japanese and Teoh despises the Japanese – with good reason. As the tale proceeds the reader finds out that Aritomo and Teoh were neighbors and it was he who designed the garden Teoh dedicated to her sister who died in the camps. Meanwhile, during the post-WWII times the garden is being created, the Communists threaten the safety of everyone. In the frame story Judge Teoh wants to refurbish the garden. This book is not an easy read – in large part due to the structure going back and forth through two eras using the same characters and with a journal going back even further. It’s slow and gentle and quiet. Fortunately, there are few major characters and the actual plot is pretty straightforward. 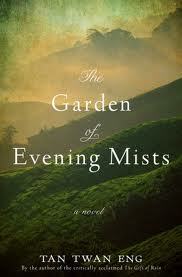 The Garden of Evening Mists takes place in Malaya during three basic time periods. The frame story is set in about 1987 or so when an 60-ish Chinese judge, who is losing her memory due to aphasia, revisits the tea plantation where she studied Japanese gardens with a master gardener. There she tries to write down what she recalls before the she loses the ability to do so. The basic memory she has to write down is what happened at between 1958-1960 – her apprenticeship with the gardener. The characters are basically the same ones as in the frame story – just 25 or 30 years earlier. The final memory she wants to set down is what happened to her and her sister in the Japanese labor/slave camps where the Chinese of Malaya were held during very end of WWII. These times are in different chapters, but not chronological at all making it a bit difficult to follow sometimes, but it’s fairly obvious if you know that much and kind of follow the verb tenses. There are huge themes involved, memory (and forgetting), colonialism – with 3 points of view, the importance of stories, guilt of various kinds. 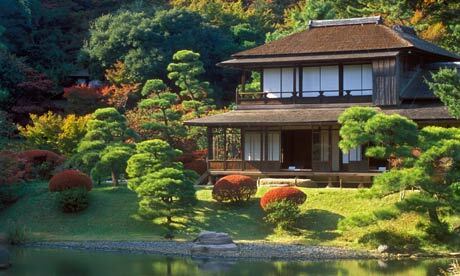 The idea of natural gardens vs controlled or “borrowed” (Japanese) gardens seems to me like a huge over-arcing metaphor. The major characters are Chinese, Japanese, British, an ex-Africaans, Chinese-Malay and Malaysian.